Someone once described the permaculture ethics as like the rules of a game. If you want to do a permaculture design, your design should aim to keep to the rules of earth care, people care and fair shares. 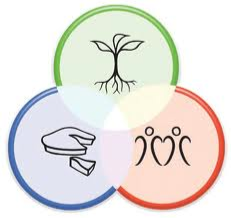 The three permaculture ethics are often depicted as a Venn diagram, as a visual reminder that we aim to design to hit the sweet spot in the middle. Earth care aims to look after and rebuild natural capital. Although often depicted as a plant, it isn’t just about plants and trees but also the air system, soil system, water system and other species. People care aims provide for people’s needs. This includes access to good food, water, air and companionship but also goes beyond that to include other needs like joy, community and fulfilment. Fair shares is about setting limits on our consumption, as well as creating and re-distributing a surplus. This may refer to our use of fossil fuels, for example, or using no more than our fair share of water and clear air. These ethics are not unique to permaculture. Many societies and communities have similar ones. But, if a permaculture design meets all three ethics, it is more likely to have a positive environmental and social impact that uses fewer inputs and creates less waste, as well as aiming to create a surplus to share with others. Sounds a bit like a more sustainable or restorative design. The principles can provide more guidance as to how a design could meet the ethics. Learn more.